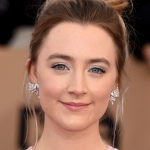 Said makeup artist Kara Yoshimoto Bua, “Saoirse Ronan’s gown has a 60s vibe, with a great deal of fabric. I wanted to create a balance with the makeup – fresh and modern, with a touch of glamour.” Here, the beauty breakdown on one of my favorite looks of the night, in Kara’s words. That SHADOW! I massaged La Solution 10 de CHANEL Sensitive Skin Cream onto Saoirse’s freshly cleansed skin then used CHANEL Sublimage La Crème Yeux Ultimate Regeneration Eye Cream under her eyes – I love it when the skin feels quenched before makeup application! For foundation, I applied CHANEL Sublimage Le Teint UltimateRadiance-Generating Cream Foundation in 10 Beige with my fingers, followed by CHANEL Joues Contraste Powder Blush in Rose Ecrin. I set the look with CHANEL Le Teint Ultra Tenue Ultrawear Flawless Compact Foundation in 10 Beige. I initially lined and filled her lips with CHANEL Le Crayon Lèvres Precision Lip Definer in Pretty Pink. I then applied CHANEL Poudre Â Lèvres Lip Balm and Powder Duo in Rosso Parthenope by moisturizing her lips with the balm, then adding the powder on top. To finish, I used CHANEL Joues Contraste Powder Blush in Rose Ecrin on the edges of her lips to set and to soften the color. I kept the eyes very simple to contrast the glamour of the dress. I applied a wash of the pink shade from CHANEL Les 4 Ombres Multi-Effect Quadra Eyeshadow in Tissé Dimensions across the entire lid, then applied the beige tone from the same palette in the crease. I curled her lashes and used a bit of CHANEL Le Gel Sourcils Longwear Eyebrow Gel in Transparent to separate the lower lashes. To highlight the inner corners of her eyes, I used CHANEL Illusion d’Ombre Longwear Luminous Eyeshadow in Mirage. I defined her brows with CHANEL Stylo Sourcils Waterproof Defining Longwear Eyebrow Pencil in Blond Tendre and CHANEL Le Gel Sourcils Longwear Eyebrow Gel in Transparent, brushing the brows upwards and outwards. Glowing, well nourished skin is essential to every glamorous look. I used CHANEL Huile de Jasmin Revitalizing Facial Oil at the end, on the cheeks, legs, arms, everywhere!